From time to time, guys who are modifying their K-bike to use an aftermarket gauge will post threads about the tachometer being unstable. The symptoms are that at idle or even certain engine speeds, the tach needle will vary widely in its indication. The question is usually around how to fix this problem. The common recommendation is to add a low pass filter to the tachometer input of the gauge to get rid of the frequencies above 5KHz. This solution is variable in its success. I tried tackling the problem today and met with pretty good success with a circuit that is a bit more complex that a simple filter. The classic K-bike in all its variants from the early K100s through the K75s to the K1100s tap off the primary winding of the #1 cylinder sparking coil. This signal is fed to the OEM cluster on the tachometer board pictured below. 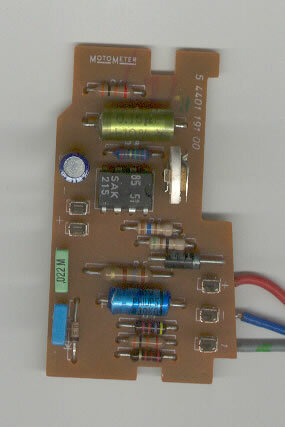 You'll notice the IC, a SAK 215, which is a Pulse Shaper Circuit for Revolution Counters. Basically this circuit takes the raw input signal and outputs a current proportional to the speed of the engine, and this current directly drives the tachometer needle on the gauge. Unfortunately, if you think that you can re-purpose this card, then you will find that it will not work with a modern aftermarket tachometer because the modern tachometer is expecting a series of digital pulses and not a proportional analog current. The ground reference is in the line in the middle of the screen with all the tick marks. You can see the signal normally rests at 12V above ground (what I've labelled as the 12V plateau) and is equal to the input voltage on the far side of the primary. Each vertical line represents 20 volts and each horizontal line represents 10 mS. When the ICU commands the coil to fire, it asserts ground which causes the signal to drop to ground potential for 10mS and then the ICU cuts the ground signal causing a large voltage spike of about 80 Volts in the primary. This spike gets amplified by the coil and causes the spark across the plug. The other anomalies you can see are electromagnetic interference (EMI) from the adjacent coils on the K75 for Cylinders 2 and 3. The signals mix together because of magnetic coupling and causes noise on the lines. It is this variable signal along with the noisy EMI that causes instability in the RPM signal, unless the signal is properly conditioned. This signal has far too much noise and anomalies on it so it needs to be conditioned to make it compatible with the aftermarket gauge. The gauge is expecting a clean square wave (as what would be found coming off the HALL Sensor array, for example). The circuitry I've devised to do such conditioning is shown below. The circuit requires 12 volts to power the output driver and 5 volts to power the rest of the circuit. It gets 12 volts from the power input on Jack J1. To get 5 volts, I've used a 3-terminal regulator, LM2940N. The diodes D1, D2 and fuse F1 are completely optional and protect the regulator from damage. The capacitor C1 is required and C2 is optional. The 5 volt rail is used to power the IC and the first two stages of the conditioner. The conditioner circuit consists of three stages. So, how does this circuit work? It looks complex but it's not (really). This shows regular 4V pulses of 1.5mS duration. The third stage of the circuit is to make the signal compatible with any aftermarket gauge. The output needs to be negative going and 12V p-p in amplitude. To accomplish this, the Schmitt trigger is fed to an Open-collector driver consisting of a single NPN transistor, T2 and resistor R7. This driver inverts the signal and protects the upstream circuitry from damage. The resistor R8 is a pull-up resistor. When the transistor T2 is off, this resistor ensures that the output rises to 12 volts, guaranteeing that the output voltage swing will be from 0V to 12V. What you are seeing is the trace on the bottom of the screen being the input signal on X1-1 in the schematic above. The upper trace is the output signal on X1-2. The lower signal is represented by 20V per division and the upper signal by 5V per division. Each vertical division is 10mS. You can see that exactly when the coil #1 primary fires, a 1.5mS negative going pulse is produced on the output. The amplitude of that pulse is 12 volts because I tied the open-collector output to +12 volt source. This pulse again repeats when the next time coil #1 fires. This circuit should stop the annoying bouncing of the tachometer needle on aftermarket gauges. I'd be interested to hear of any experiences with this circuit should some here decide to build it. I am planning on integrating this circuit into the next version of my TGPI board. There are many features/functions of this gauge which are annoying, but the one big one for me was the RPM feature. This gauge is unlike any other gauge available from other manufacturers in that its tacho input requires the engine speed signal to go negative relative to ground. This is annoying because it's hard to to generate voltages below the level of the frame ground. However, for this particular gauge, the capacitor C7 and resistor R14 accomplish the task. These two components are only strictly needed for this Chinese gauge, otherwise all aftermarket gauges function well without these components. P.S. Don't have an oscilloscope? No problem, use the sound card on your PC as an oscilloscope. That is rather a helpful offering, I'm not yet in the market to change my stock dash around but who knows what will happen once I've got my little K75 back on the road and testing on other stuff underway. Do you offer these items assembled? In any case, thanks for your expertise. Yes, next version of my TGPI board will have this circuit included. Here is the writeup on v5 of the TGPI board. What you are seeing is the trace on the bottom of the screen being the input signal on X1-1 in the schematic above. If you attached images to correspond with these phrases, Robert, they're not showing on my monitor. Thanks for the heads up Laitch. I see them in my browser, but that could have been cached. In any case, I rehosted the images on Motobrick and edited the first post. Are they visible now? In any case, I rehosted the images on Motobrick and edited the first post. Are they visible now? Updated the image links again. Any improvement? This is so good. For years I have struggled with basic electronics - trying to understand what happens in circuits - and then I read your thread and it's like someone switched the light on. I am 55 years old and so pleased - it's been a long time. So, what am I on about? Well, I've had the usual problems fitting the cheapo gauge to a K. I'd already worked out that I could pinch the speedometer driver board form the OE instruments, and I made up a set of relays to decode the gear position sender. That was the limit of my electronics (lack of) insight. But when it came to the tacho, it plain didn't work. I hadn't expected it to after searching this forum, and the idea of 'filtering' the signal was just a downright mystery to me. There's various filters described, and I tried making some of them without acceptable success. I can nod sagely to myself about bothersome 'spikes', but I was unable to step outside smarter people's footsteps and come up with a solution. AND TODAY, I GOT THE EXACT SAME TRACE AS YOU! AND (this is the important bit) I ACTUALLY KNOW WHAT I'M LOOKING AT! Oh joy. Tomorrow I'm going to play around with capacitors (I now know what they do!) and I'm sure I'll crack it. The part of the board I populate with the conditioning circuitry is on the left side. I eliminate the components on the right side of the board, which is the gear display. 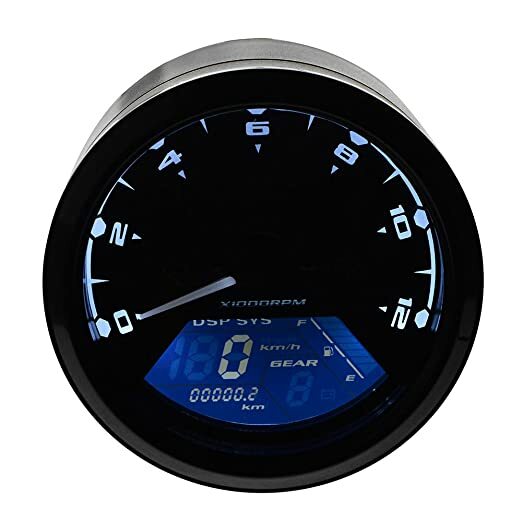 I need your TGPI board design for the Chinese 12000 RPM Motorcycle Gauge. I have written to you in direct. Can you send me your design for same speedo to please?